Adults and children over 3 years. 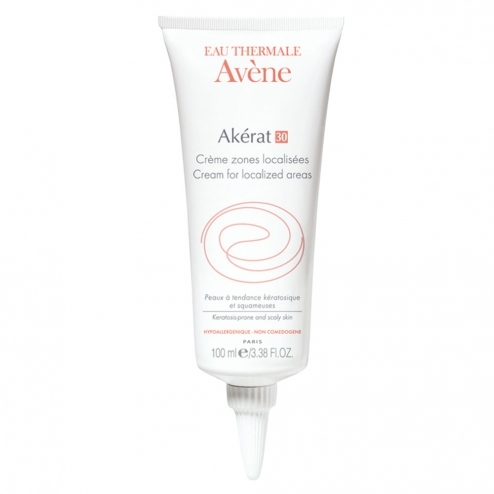 With the soothing properties and anti-irritating Avene Thermal Spring Water, Ak�rat S soothes fragile skin, soothes skin irritations. The association in hydrating, emollient and helps restore suppleness keratoreductor to the skin by compensating for the dry skin, removing dander and reducing areas of thickened stratum corneum. For body: apply 1-2 times daily gentle massage on localized areas. For the scalp: can be used on the scalp dry and unwashed. Apply using the cannula tip, leave for several hours, possibly overnight. Rinse and wash with shampoo. Do not use on children under 3 years. Avoid contact with eyes. Do not apply to injuries (wounds, infections). Composition: formula INCI: Aqua, Aqua Avene, urea, propylene glycol, Paraffinum liquidum, cyclomethicone, triethanolamine, polyacrylate-13, Prunus dulcis, salicylic acid, polyisobutene, lactic acid, phenoxyethanol, dimethicone PEG/PPG-18/18, polysorbate-20, tocopheryl acetate.